CPAP chin strap positions jaw correctly. CPAP mask strap gently cradles your jaw and keeps your mouth closed as you sleep. Neoprene with soft inner lining. 31"L.
I have tried other examples but this is first that works. Does not disturb my sleep. I don't use a C Pap machine, so I can't say how well this works for that purpose. But I saw something similar sold for much more, as an anti-snoring device. I don't snore, but I do sleep with my mouth open, and it's been a problem. I use a dental mouth guard to prevent teeth grinding at night, and I'd wake and find it moved out of place due to my mouth having opened. I bought this in the hopes keeping my mouth closed would help. Also, I'd wake with a painfully dry mouth. I've used it since the day I got it 2 weeks ago, and can't believe the improvement in my sleep! I never realized how my open mouth somehow was disturbing my sleep. I have had most nights sleeping all the way through the night. No dry mouth, and no painful jaw from grinding or clenching. I thought it would be uncomfortable, but honestly, it's not. People talk about the straps being too long, but I just had to play around with the position and the tightness of the Velcro the first few nights. I'd like if it came in colors other than black. The basic concept of the design is good but it needs to be modified. First, the velcro needs to be extended on the main strap to adjust to smaller heads. Second, there needs to be velcro tabs placed perpendicular to the main side straps. Otherwise, the additional strap will not stay in place and then the main strap will then loosen and not do what it is designed to do. Actually don;t use for CPAP. Use it because I open my mouth when I sleep and use it to prevent dry mouth. To keep the velcro on the straps from pulling loose, we sew them on at the exact length we need- also eliminates excess unneeded strap. Works great- got extras so can have one in the wash as required. The Chin Strap works great. but there are no instructions on how to use the strap. If you do not cut the access strap away it will tangle with the straps of the cpap straps and this is why I give it the 3 stars. It serves the intended purpose and easy to use. Back strap not attached on one side so that adjustment is very difficult especically for the eldery. looks good but doesn't stay on. it does not stay where you need it.It is supposed to support my chin when I am wearing my mask. It does not. It slides off my head no matter what I do to try to keep it in place. Great idea but it doesn't work! The shorter velcro strap will not stay velcroed and without it, the chin strap won't stay on head. Very dissapointed in this product. The design is ok, but the fabric quality was very poor. The lining started separating after just a few nights of wearing it. Not as shown in photo. Back of head strap (needed to keep chin strap in place) is attached by velcro. In photo it appears attached to strap or at least attaches nicely. In reality, long extra pieces of the strap go way beyond the chinstrap and are in the way and uncomfortable. They must be cut (instructions say to do this). Thought it would keep mouth shut. I had it as tight as possible and mouth opened easily. Snoring as loud as ever. Very disappointed!!! just trying it to see ie help to keep mouth close. need my old one is used up. to get a better one for me and my roommate. I suffer from dry mouth. I want something that will help with that. MY HUSBAND IS ON A CPAP MACHINE AT NIGHT BUT HE CAN'T KEEP HIS MOUTH CLOSED . SOUNDS LIKE HE IS BLOWING INTO THE MASK. I chose this to keep my mouth shut during the night so I could use a nasal connection instead of a face mask for my C-pap. I find that my jaw drops and hope that this will help me with dry mounth. Choose this for my StepSon. Wanted to try new chin strap. Different than the one I am using. My husband asked me to order it for him - happy to do so. To hopefully help with my sleep apnea problem. I needed a new one and the price was reasonable. For my husband to use with C-pap machine. Works well for him. Because my mouth tends to open when i sleep. And i wake up with dry mouth. So i hope this works. need to keep mouth shut for my CPAP to work and it looks easy and comfortable and the price is Great! Husband finds it is the MOST comfortable chin strap ! My spouse is a mouth breather. My doctor told me I needed it. cpac chin mask what sizes does come in? BEST ANSWER: Thank you for your question. 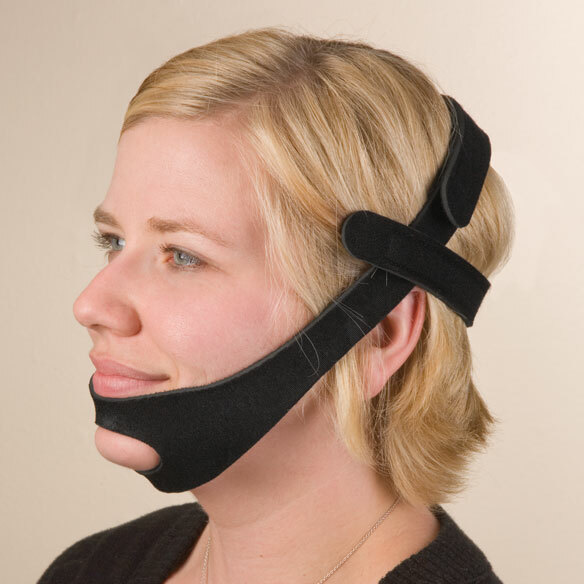 The CPAP Chin Strap only comes in the one size of 31" long. We hope this information will be of help to you.